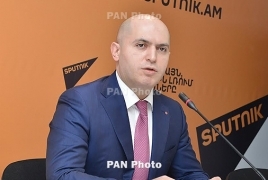 PanARMENIAN.Net - Germany could ratify the Comprehensive and Enhanced Partnership Agreement between the European Union and Armenia by May, former lawmaker, Deputy Chairman of the Republican Party of Armenia (RPA) Armen Ashotyan said in a Facebook post. The European Parliament, Great Britain, Romania, Denmark, Bulgaria, Poland, Estonia, Latvia and Lithuania have so far ratified the CEPA. Ashotyan and several RPA members like former lawmaker Arpine Hovhannisyan and former Defense Minister Vigen Sargsyan paid a visit to Germany recently. The former member of parliament revealed that dialogue on the visa liberalization will start in 2020, with the Armenian government set to conclude all the preparatory work by then. Though the Republicans did not make it to the National Assembly in December elections, Ashotyan said the RPA’s "international contacts will continue serving the two Armenian Republics (Armenia and Nagorno Karabakh - Ed.) and the Armenian nation."